2007 August | Oh Shknit! Washcloth and Christmas knitting beginneth! Well, I not only finished the one I had started on last week, but I have another one done, and another one on the needles. I have decided I am going to make these for Christmas gifts. They are fast, easy, and completely affordable for a broke girl like me. The one I have on the needles right now is Peaches and Cream Peppermint, red and white variegated (what else)? I wanted to try one with just one color/colorway to see how that looked too. Anyways, this weekend mom is going to come over and help me dye yarn for her Christmas present. She doesn’t know that’s what we are dyeing it for, but shhh, she doesn’t need to know that. I am taking this yarn, measuring it out, and using some grape kool-aid to dye it a sort of muted, dark purple. She isn’t much of a beige chick, and she likes purple a lot. I am going to knit her Branching Out. I will be starting on that as soon as I get it dyed, washed, dried, and reskeined. I got that HUGE cone of yarn for $3.99 at a thrift store. So this gift is going to literally cost me pennies to make! Yay! I just saw on Craftzine this Knitting Basket Cake. How awesome is that? And this is a couple of months old, but there are also these knitting cupcakes that I ADORE. It makes me want to make sweets just to try it out! The details are incredible. This is a super quick knit! I started it this morning and am already half-way done. That says a lot for me, world’s slowest knitter. I got some of this random cotton yarn from my mom. It’s really splitty but I wanted to use it for a dishcloth, and thought it was a good time to try this pattern out! The pattern calls for size 7’s, but I had 8’s readily available so I used them instead. I should have used 7’s, because it’s too loose. It’s still fully functional, though, so I will keep on keeping on. I have 2 more skeins of this yarn, so I will try again with 7’s and compare. I have knitting A.D.D. right now. I didn’t get any done on JD’s sweater, and I tore out the very little bit of Rusted Root that I had started. I want to finish the sweater and the capelet before I cast on any other big projects. 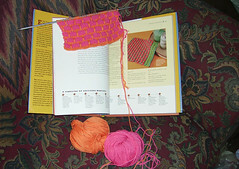 I finished my iPod cozy but the cast off was horrible, so I am trying a couple of things before I post pics of it. My 2 favorite things ever…rolled into one! I don’t know who here peruses Colour Lovers, but I love that place. I am a budding, self-taught web designer, and I love colors. Well, they have a special blog entry just for SOCK KNITTERS and the color schemes that stem from said socks. *drool* I actually tried using the Opal Colourway to revamp my MySpace Layout, but I don’t like how it looks, so I’ll have to be redoing that (I’ll screenshot it before I change it). In other news, I am working on a little iPod sock from some wool that I dyed in limes and aquas. The dying was a little experiment, so I don’t have a whole lot of it, and since I wanted yet something else to pad my poor little abused iPod, iPod sock it is! I hope to at least get the back of Johnathan’s vest completed. I only have about 10 more rows, then I have to weave in the loose bits and stitch the front and back together, and add ribbing to the collar and armholes. I would like to say I have worked on mom’s socks, or Rusted Root, but I haven’t been doing much knitting. My usual knitting time is spent perusing Ravelry, it’s completely like crack and something the online knitting community has really been in need of. I am glad it’s around.